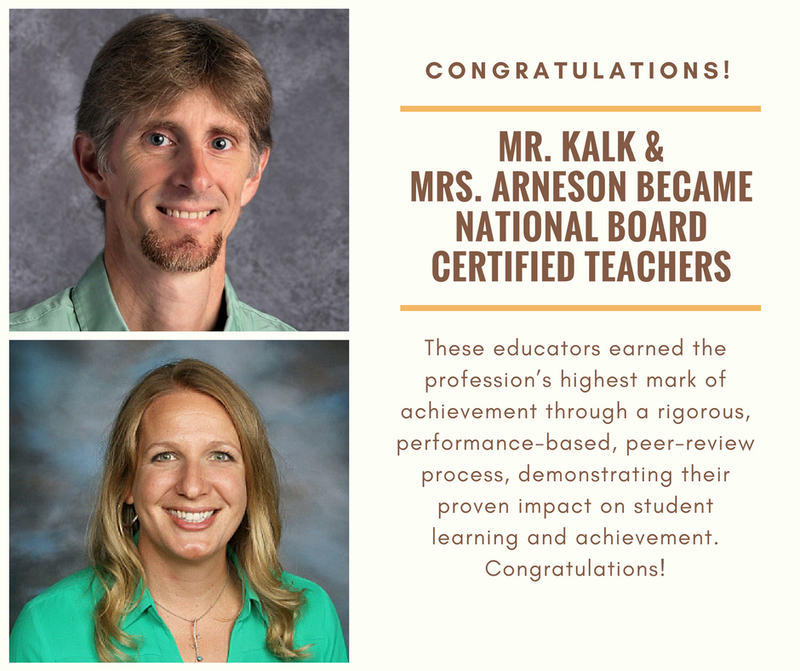 Congratulations Gary Kalk and Dannielle Arneson on becoming Nationally Board Certified Teachers! —The National Board for Professional Teaching Standards celebrates 5,470 new National Board Certified Teachers (NBCTs) and another 3,957Board-certified teachers who successfully renewed their certification. These teachers join a growing community of Board-certified teachers, now more than 118,000 strong across all 50 states. Each of these accomplished educators earned the profession’s highest mark of achievement through a rigorous, performance-based, peer-review process, demonstrating their proven impact on student learning and achievement. Mr. Kalk is one of 33 educators in the state of Wisconsin and one of 4,614 in the nation, certified in Mathematics- Early Adolescence. Mrs. Arneson is one of 18 educators in Wisconsin, and one of 1,906 in the nation, certified in Art - Early Adolescence through Young Adulthood. Both have worked for the past two years to accomplish this goal. Mr. Kalk and Mrs. Arneson join fellow HG teachers Mrs. Julie Johnson and Mrs. Joelle Barrett in the district with this honorable distinction. Congratulations!